Dominque Smith started her life fighting to survive. Weighing only three pounds at birth, the doctors told her mother, Cynthia Smith, that Dominque would likely not make it past her first birthday. Dominque proved them wrong; the first of many milestones she would surpass with strength and determination fueled by her mother’s love. 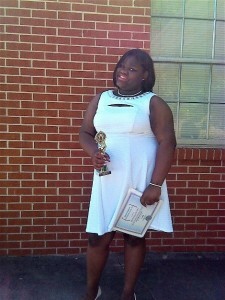 Even with her continued health struggles, Dominque persevered and made it to elementary school. Unfortunately, she began to encounter bullying from other classmates by the time she was in 4th grade, which eventually trickled over and impacted her academic performance. Despite her mother Cynthia’s best efforts, the bullying continued and Dominque’s grades declined along with her happiness. The last straw was when Dominque fell at school and suffered a concussion, and Cynthia was not notified by school staff until much later in the day. With Dominque’s wellbeing at risk and her spirit crushed, Cynthia knew that she had to do something to save her daughter from a potentially disastrous future. In her quest to find the right academic environment for her daughter, Cynthia began to look into private schools in her area, although she knew as a single parent on a limited income the tuition would be a far stretch for her finances. However, the staff at one of the schools told her about Georgia Qualified Education Expense Tax Credit Scholarships available through the AAA Scholarship Foundation and she was able to apply on Dominque’s behalf for the next school year. The scholarship gave Cynthia the ability to find the right academic setting for her daughter and it has made all the difference in the world. Over the past five years, Dominque has blossomed into an engaged student with a more positive outlook. While she has still had some health struggles over the years, the encouraging support she has received at school has boosted her confidence and the impact is tremendous. Her grades are soaring and she is stepping outside her comfort zone, including participating in activities like archery, drama and motivational speaking, as well as dance performances at her church. A huge step for a young girl who once shied away from social activities. Now in the 11th grade at Young Americans Christian School in Conyers, Ga., Dominque is starting to look towards her future. She is currently considering a future career in forensic science and is looking into colleges both near and far. Despite the sacrifices she has had to make to ensure her daughter attends a school suited to her needs, Cynthia has no doubt that it is worth it. AAA Scholarships are funded in Alabama, Arizona, Florida, Georgia, Nevada and Pennsylvania by corporations that redirect a portion of their state tax liability to the AAA Scholarship Foundation in exchange for a tax credit (dollar-for-dollar in Alabama, Arizona, Florida, Georgia and Nevada, and up to 90 percent in Pennsylvania). The AAA Scholarship Foundation is one of the only approved Scholarship 501(c)(3) Nonprofit Organizations exclusively serving qualifying low-income, disabled and/or displaced students through these tax credit scholarship programs. AAA Scholarship Foundation provides your company with the convenience and efficiency of a single-solution for participating in multiple state tax credit scholarship programs. For more information, or to learn how your corporation can participate in the program, visit www.AAAScholarships.org, or contact Kerri Vaughan at kerri@aaascholarships.org or 888 707-2465 ext. 730. Click here for a pdf of this student spotlight.